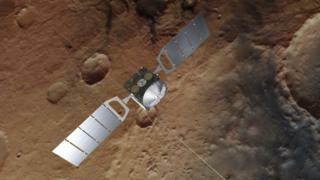 A European spacecraft has confirmed a report of methane being released from the surface of Mars. The methane spike was first measured by Nasa's Curiosity rover on the surface; now it has been confirmed by the Mars Express orbiter. The nature and extent of methane in the Martian atmosphere is intensely debated. The gas is of interest because terrestrial methane can be made by life forms, as well as geological processes. Methane is only supposed to have a very short lifetime in the Martian atmosphere, so detecting it there means it must have been released very recently. A strong signal of methane was measured by the Curiosity rover on 15 June 2013. The measurement was confirmed in data collected the next day by the Planetary Fourier Spectrometer (PFS) on board Mars Express. The results from two studies are outlined in the journal, Nature Geoscience. "In general we did not detect any methane, aside from one definite detection of about 15 parts per billion by volume of methane in the atmosphere, which turned out to be a day after Curiosity reported a spike of about six parts per billion," says Marco Giuranna, principal investigator for the PFS. "Although parts per billion in general means a relatively small amount, it is quite remarkable for Mars - our measurement corresponds to an average of about 46 tonnes of methane that was present in the area of 49,000 square kilometres observed from our orbit." At the time of Curiosity's detection, it was thought that the methane might have originated north of the rover (because the prevailing winds were southward), and that the release came from inside Gale Crater, Curiosity's landing location. The team made two independent analyses to home in on potential source regions of the methane, dividing up a wide region around Gale Crater into grids of about 250 by 250 square kilometres. There are a variety of ways methane might be produced on Mars. If microbes still exist, they are one possible source. Methane produced by micro-organisms in the distant past could also get trapped within ice. When the ice melts, it could then release the ancient methane into the atmosphere. But there are geological processes that can produce methane, and don't require biology. These include serpentinisation - a process of mineral alteration in the crust involving heat and water. Methane can be made as a downstream product of serpentinisation. Marco Giuranna suspects the plume didn't originate from Gale Crater. Scientists scrutinised the region around Gale for features where gas seepage is expected. This process is well known on Earth to occur along tectonic faults and from natural gas fields. "We identified tectonic faults that might extend below a region proposed to contain shallow ice. Since permafrost is an excellent seal for methane, it is possible that the ice here could trap subsurface methane and release it episodically along the faults that break through this ice," said Giuseppe Etiope from the National Institute of Geophysics and Volcanology in Rome, a co-author on one of the studies. "Remarkably, we saw that the atmospheric simulation and geological assessment, performed independently of each other, suggested the same region of provenance of the methane." The ExoMars Trace Gas Orbiter, which is designed to make a detailed inventory of the Martian atmosphere, was launched in 2016. However, it has yet to report its science results.